1. DONT look at ANYBODY. Instead, fix your gaze on some faraway place about 300 miles ahead and 10 miles above you. Otherwise you are a goner, having clearly shown that you want to buy a lapdance, t-shirt, tour or someone’s daughter. 2. Do I really look straight to these people? Why am I offered all matter of woman in all manner of positions doing all manner of thing for 400 baht (negotiable)? 3. There is NO breeze and it is VERY humid. (and this is cool season!) Give in, become one with and at peace with the pool of sweat that surrounds you. 4. Nothing is the price it says it is. 5. Everything is for sale. 6. Except peace and quiet. 7. I gave into the heat today and had an iced latte at the mall. Can the runs be far behind? 8. Shopping is clearly the national pastime. 9. Foot massage is the second national pastime. 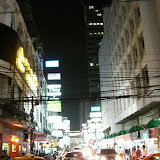 Bankok looks nothing like I imagined! What is the power source of a tuk-tuk?? Sheila, a “tuk-tuk” is actually the name of the small asian rodent that turns the wheel in the trunk of the scooter that makes the “tuk-tuk” go. I agree with Sheila…nothing like I imagined. Cool BKK airport though. The city looks both much more modern and orderly than you describe them…though having traveled to capitals in developing countries, pictures can be a bit misleading. Why am I not surprised to find toilet shots? LOL.